Bring 3 cups of water to boil in a large saucepan. Rinse farro under running water until water runs clear. Add farro to boiling water, cover and simmer on low heat until tender, about 25-30 mins. Drain farro and spread an even layer on a baking sheet, let stand until cool (about one hour) or place in the fridge for 30 mins. Place extra virgin olive oil, vinegar, mustard, salt and pepper in a small jar – attach lid and shake until combined. 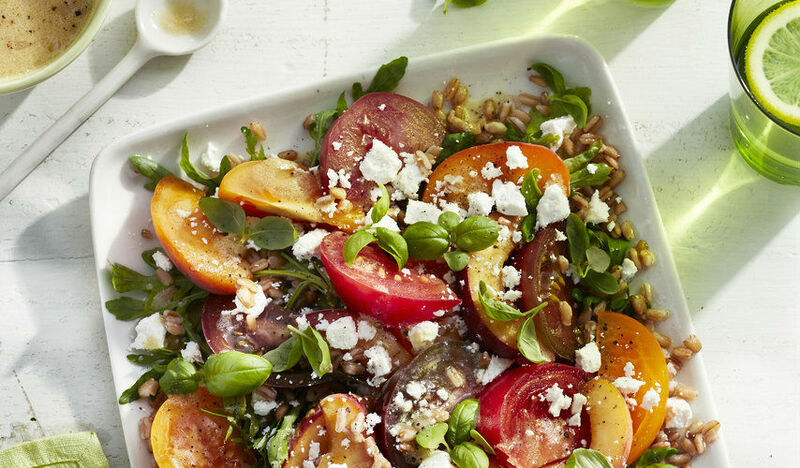 Toss farro and watercress with 2 tbsp of dressing, add chopped tomatoes, onion, peach and basil and spoon over the farro mix. Top with crumbled greek feta and serve with the remaining dressing on a side.